Pinal County Public Works Material Recovery Center provides a waste tire drop-off site west of Florence at 12725 Adamsville Road. For additional information regarding this service, please call (520) 866-6685. Pinal County requires all Waste Tire Generators to fill out the Pinal County Waste Tire Generator Disposal Permit annually. Pursuant to Article 8 Waste Tire Disposal, A.R.S. 44-1302, F, Pinal County is required to establish a registration procedure for their waste tire collection sites. In accordance with the statue, any business that generates waste tires in Pinal County and desires to dispose of these waste tires at a Pinal County Waste Tire Collection Site, must register and have a current Pinal County Waste Tire Disposal Permit. Please note obtaining a permit only applies to a business. Citizens do not need a permit. Limit 5 per year/per person (no cost). Any additional car/pickup truck tires are charged at a cost of $1 per tire. Additional semi-truck tires are charged at a cost of $2 per tire. Off-road vehicle/tractor tires are charged at a cost of $140 per ton (2000lbs) and must be weighed at a scale and the scale ticket must be present when disposing the tires. 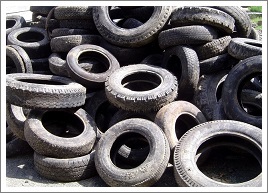 Businesses must register and have a current Pinal County Waste Tire Disposal Permit. A Pinal County Waste Tire Disposal Manifest is required for every disposal at a Pinal County Waste Tire Collection Site. The Pinal County Waste Tire Facility will now be accepting debit and credit cards at the Adamsville site location. Please be aware there is a $1.50 processing fee for all transactions. You can help discourage illegal dumping by calling the Pinal County Illegal Dumping Hotline.